Last time around, I outlined what would go into my build. This time, I’ve actually placed the order for the parts. I was originally going to place with newegg, but the motherboard was out of stock. This forced me to consider amazon instead. Amazon had everything, and at fairly decent prices. That plus prime shipping, and good return policy, made it a relative no brainer (sorry newegg). I did a hand wave on some of the parts in the last post, so I’ll round out the inventory in detail here. this item used to require a ton of thought in the past, but today, you can spit in generally the right direction and things will likely work out. I wanted to outfit my rig with 64GB total ram. I wanted RAM that was reliable and looked good. I probably should have gone for some red colored stuff, but I went with the black G.SKILL Ripjaws V Series DDR4 PC4-25600 3200MHz parts (model F4-3200C16D-32GVK). They come in sets of two (32GB per set), so I ordered two sets. Who knows, maybe I’ll get lucky and they’ll be red. I know from my laptop, and my current Shuttle PC that having a SSD as your primary OS drive is an absolute must these days. Please, no 5400 RPM spinning rust! 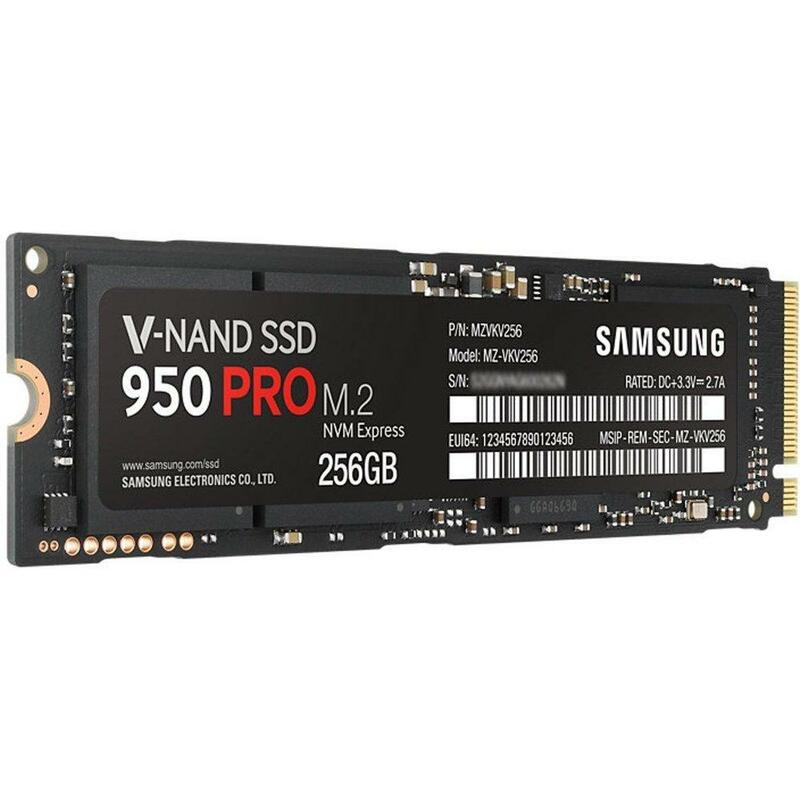 On this item, I chose the Samsung V-NAND SSD 950 Pro M.2 NVM Express 256 GB. What’s this NVMe thing anyway? Well, turns out that flash disks are way faster than spinning rust (go figure), and yet we’ve been constrained to the spinning rust interfaces and data transfers of old for quite some time. NVME represents a different interface to the flash memory, going way beyond what Sata can provide. Luckily, the chosen motherboard supports this interface, so I should be able to boot up from this super fast thing. I probably should have gone for the 512GB version, but things being the way they are, I can probably install a much larger 1TB version in 3 year’s time for the same price. This will be more than good enough for now, and for the forseeable future. I did get some spinning rust to go in the box as well. Western Digital Black 2TB – WD2003FZEX (7200 RPM SATA 6 Gb/s). I have a pair of these spinning away in my Synology NAS, and they haven’t failed in the past 4 years, so I think I’m good with this. I could have gone with a bigger size, like 6TB, but I’m thinking why put so much storage on a single disk. Better to spread the load across several disks. As long as I’m spreading the load across several disks, why not just use a giant NAS with an optical link, or 10Gbit ethernet or something. As this machine is going to find multiple uses with multiple OSes, I didn’t feel the need to make it a storage monster. Rather, it is a show piece, workstation with decent performance. More specialization can come through additional equipment outside the box. I have yet to consider my cooling options. When the boxes arrive, I’ll assemble once just to make sure all the parts work. I’ve been eyeing some cool looking Thermaltake liquid cooling gear. I’m considering the whole reservoir/pump/tubing thing. It looks cool, and there are ready made kits that look fairly easy to assemble. The open case I’ve chosen just begs to be mod’d with the liquid cooling stuff. At any rate, boxes should arrive in a week. I took advantage of the Amazon offer to get $5.99 gift certificates towards using their pantry service instead of getting next day delivery. How crazy is that! I figure I won’t be able to assemble until next week anyway, so why not get some free stuff from Amazon in payment for my patience. Having this kit arrive will be an incentive to further clean up my office (man cave) so that I’ll have enough desk and floor space to spread things out, take pictures, and assemble without losing any of the pieces. Local Manufacturing – Is that a factory in your garage? Why the whole table saw cabinet thing? Well, I first purchased the SawStop a few years back because I wanted to make some fairly good triangular bases for a 3D printer project. I figured that as an occasional workshopper, it’s better to have more expensive tools with safety features, so that I can preserve my white collar hands. More recently, I’ve wanted to expand the capabilities in the shop. I want to cut wood of course, but I want to cut it in infinite variety. I have a nice heavy duty router, which gives me some capabilities. I have a cheapo band saw with still others. I probably need a scroll saw for really intricate stuff. I could use a mill to play with various metals, and a lath might be interesting as well. Well, that’s adding up to be a lot of different bits of equipment, all with their own safety and space concerns. Then I got to thinking, what I really need is an automated (CNC) platform that I can use various tools on. After quite a lot of browsing around, I came across the Grunblau Plaform CNC kit. What’s so great about this particular machine? Well, it looks good for one. It’s uses 80/20 extrusions, like most DIY CNC machines, but it throws in just enough steel to make it more subtle, and easier to assemble than your typical machine. This is what mine looks like after a couple of weekends of assembly. First weekend was laying out parts, and assembling the base. 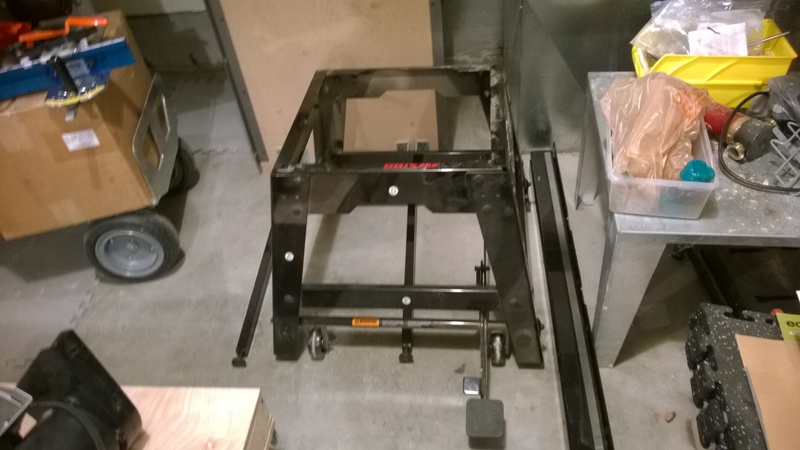 Second weekend was assembly of the gantry, and mounting to the base. But this begs one question, where to put this thing. It’s roughly 3’x5′ and a couple feet tall. It takes up more room than a table saw, but less than the combination of tools that I intend for it to replace. So, of course it needs a piece of shop furniture to go with it. That’s a base made of 2×6 and 4×4 lumber, with a 3/4″ maple plywood skin. The skin will be closed on 4 slides, which leaves the ability to slide it back if that’s ever needed. The skin is not fastened to the base in any way, as gravity working on the skin, as well as the machine itself, should be enough to hold it in place. If not, then a couple of screws at strategic positions should be more than enough to hold it in place. I’m awaiting some nice leveling casters which will make this as portable as the table saw. I wanted to try the leveling casters as its yet another option for mobility. In this particular case, the machine will mostly stay in the same place all the time. But, when it comes time to move it, I want it to be a relatively easy operation. These Footmaster GDR-60F Leveling Casters seem to foot the bill, so I’ll see how it goes. This makes for interesting theatre. The other day, I had a neighbor wander into my garage and exclaim “wow, you have a lot of tools, what do you build with them?”. Well, I, uh, that is, you see, I just like to tinker. Fact is, mostly I’ve built shop furniture to deal with the various tools that I’ve been buying over the years to build shop furniture. But, this time is different. Now I’ve got my 3D printer setup. I’ve got my table saw squared away. I’ve got the CNC Router coming into existance. Surely a Murphy bed, or some kids playscape in the downstairs, or at least a jewelry box for the wife? The fact is, I like designing and building “furniture”. I can’t help it that my man cave is the primary beneficiary of said furniture. But I think there’s something else here as well. As the machines become more versatile (through the beauty of software), my ability to manufacture all manner of things locally improves. I’ve wanted to build things out of aluminum for the longest time. Now, with the CNC Router, I’ll be able to do that. This is the same sort of enabling that occured with the birth of the 3D printers. I can at least design and prototype my own stuff, and print it in plastic. Now I’ll be able to actually build some molds for injection or other molding if I so choose, which is a next logical step to the all too slow process of using FDM printers. So, am I building a factory in my garage? Well, I consider it a definite evolution of the American garage. 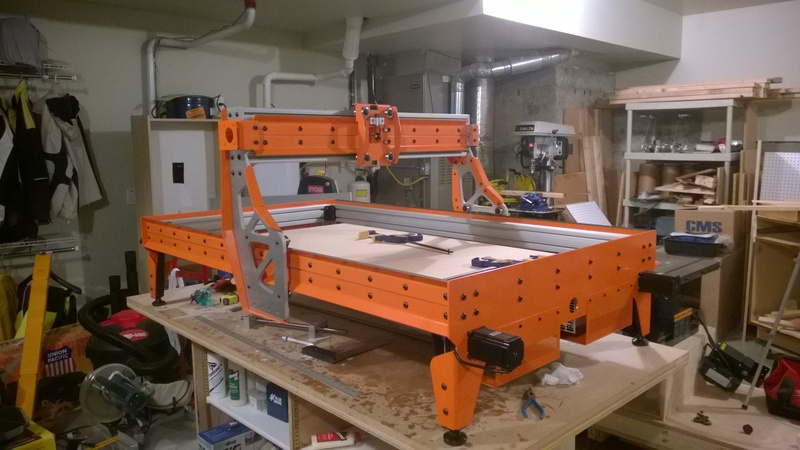 A CNC router can take the place of a lot of typical woodworking tools. It also adds the ability to mill soft metals, cut with a knife, draw with a plotter pen, carve with a plasma torch, or possibly a laser. 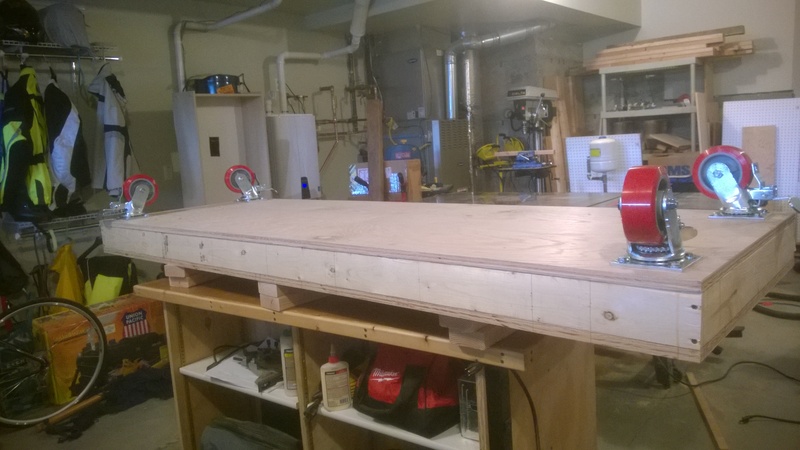 Add another axis, or two, and suddenly you’re doing 5 axis milling in your garage. Yah, this is way cool. Not necessarily a factory in the garage, but certainly a “local manufacturing plant” in our neighborhood. 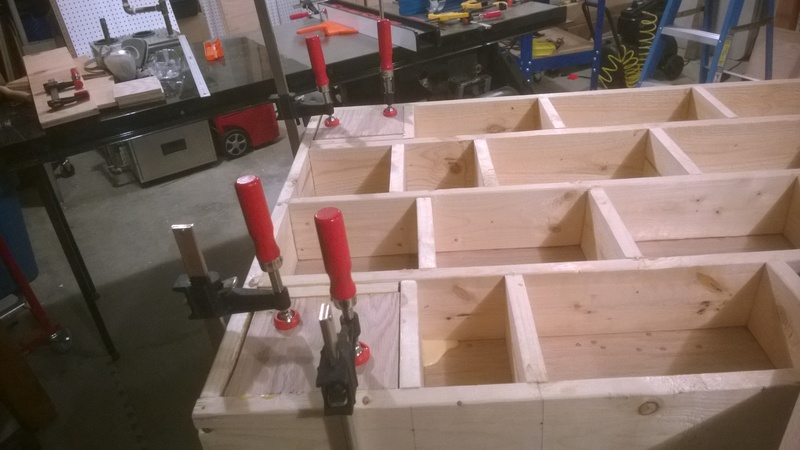 Last time around, I had finished my torsion box base with low riding sliding drawers. 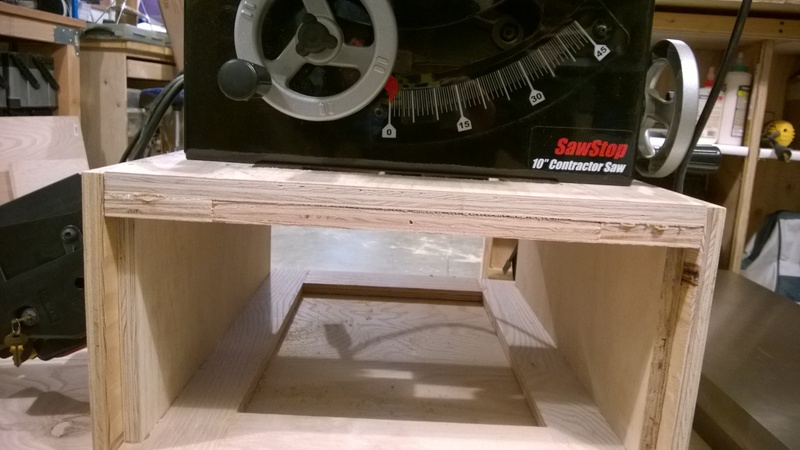 The next step in the journey was to construct the box upon which the saw itself will sit. I looked at many options. Solid wood, plywood, open frame, closed frame. I needed to integrate dust collection as well, and possibly storage. In the end I created a design which is a combination of a couple of things. The box is constructed entirely of 3/4″ oak plywood. The bottom is constructed of a rectangle which is put together using Kreg pocket screws. The top ‘mid-top’ is the same. They are held up on the sides by solid plywood. The very top is a solid piece of plywood, with a hole cut out of it to match the swing of the motor and dust collection port on the saw. This could also have been constructed using the Kreg framing, but I wanted to try this way as well. That forms the basic box. It was pretty solid, but I wanted to go one step further. I put additional plywood sides on with full surface gluing. This should prevent any rocking forward/back. Before usage, I will stick a false front on the thing, and that should eliminate any side rocking. It’s feeling pretty solid though, so I don’t think there will be much. Here’s what it looks like with the saw sitting atop the box, atop the rolling base. I had to strip it down so that I could then slide it off the base and onto the box without the help of others, or a hoist. There’s the old steel base, ready to go for its next adventure. Most of the builds I have seen have the forethought of incorporating a sloping slidey thing for the dust chute, or a drawer, or sliders, and what have you. I could not think through my dust collection options completely, so I just designed the base as an open box. That way, I can build any type of drawer, slide, tubing, what have you, and just slide it into the open slot. If I want to change it later, I can, without having to build a whole new base/box. I also decided that I don’t need to go for a full integrated unicabinet design. In fact, it’s better to make this whole thing modular so that I can change it easily over time as my needs change. For example, most builds have the saw mounted as I’ve shown here. Then they have large outfeed tables so that they can do long rips. Well, truth be told, most of what I’m going to be doing on a table saw is probably longish rips, or fairly short stuff where a sled will be utilized. So, having all this width isn’t really that beneficial. 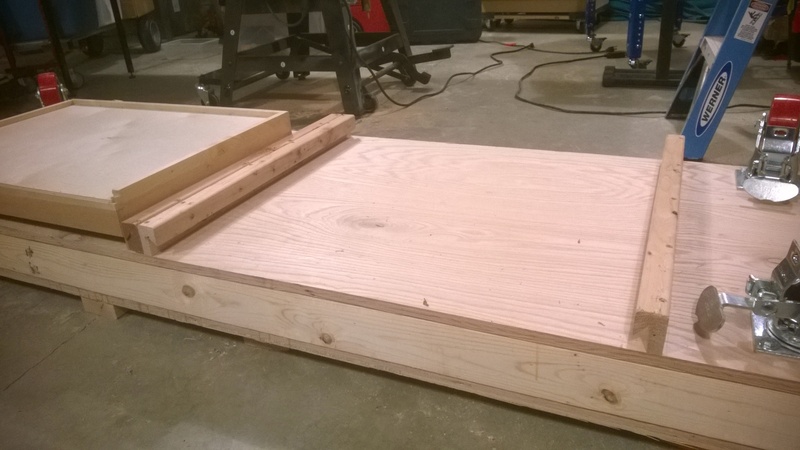 Easy enough, I can just turn the box sideway, and layout an outfeed table atop the torsion box, and be done. To that end, the base is simply screwed down to the torsion box. It’s not glued. Other boxes will be constructed, and just screwed down as well. Whether it’s drawers, a router extension, or what have you, just throw it on there, and get to making chips! 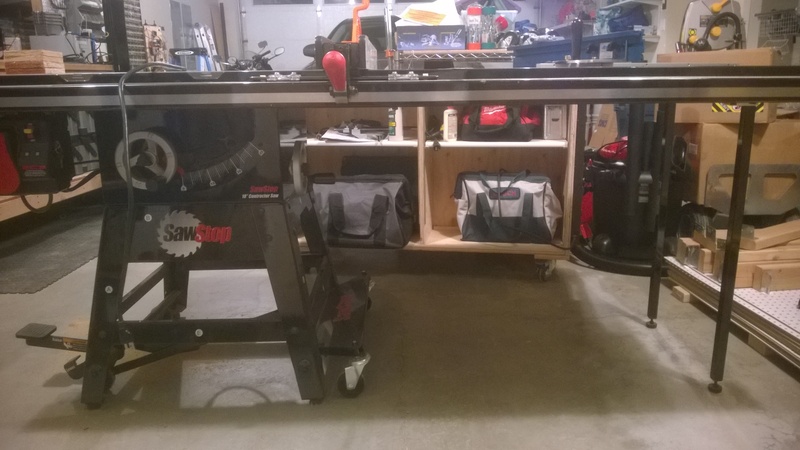 I have this great table saw, the SawStop contractor saw. The great thing about it is the ability to stop the saw blade instantly if it ever touches flesh. Considering that I’m an occasional woodworker, this sounded like a good idea, and actually came from a recommendation of someone who was a regular woodworker, with half a sawn off finger. Besides being a finger saver, the saw itself is quite a nice saw. Mine is configured with the nice T-square fence system, rather than the regular contractor’s saw fence. In addition, it has the 52″ rail, which means the overall length of the thing is 85″. That’s a pretty big and unwieldy piece of equipment for the garage. There are myriad other examples if you just do a search for ‘table saw cabinet’. A fairly loose set of constraints (looking just like software), but good enough to help make some decisions. The very first step is deciding on what kind of mobility I’m going to design for. I considered many options, but they roughly boil down to, locking swivels, on at least 2 corners. For the wheels themselves, I chose a 5″ wheel, where each wheel has a 750lb capacity. That seems heavy duty enough for this particular purpose. 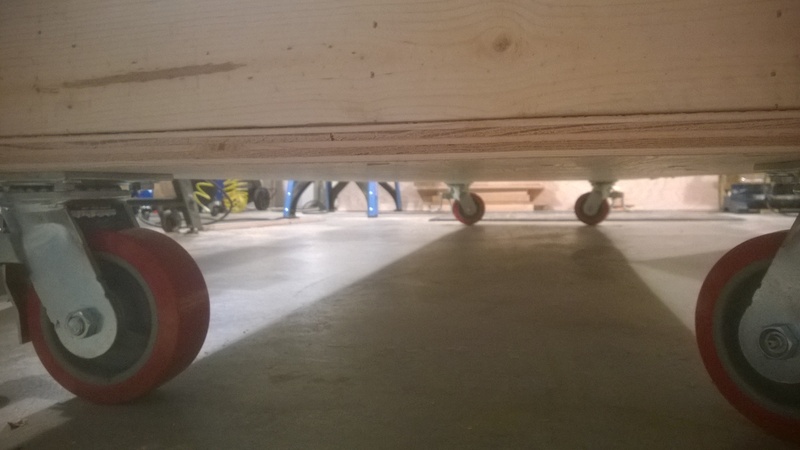 I could have gone with 3″ wheels, but that seemed too small, and I read from other efforts that the bigger the better, considering the resulting weight of the cabinet could be several hundred pounds, and moving that with small wheels might have a lot of friction and be difficult. I chose to use 4 locking swivel wheels, one at each corner. The overall length of the cabinet is 86″, which had me thinking about sagging. Perhaps I should stick more wheels mid-span just in case. But, I chose instead to go with an engineered solution. The base is built out of a torsion box. 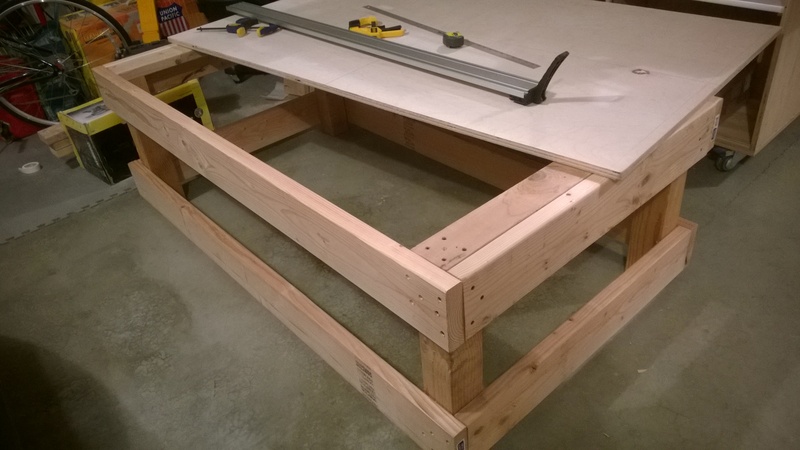 The torsion box consists of 1×4″ lumber forming the internal supports. That is trimmed by 1×4″ on the outside, and it’s skinned top and bottom by 3/4″ oak plywood. I studied many different options for constructing this beast. Probably the best would have been to cut slots in crosswise members and laid them uniformly down the length of the base. But, I don’t currently have a dado blade on my sawstop, so I went with these smaller cross pieces instead. I think it actually turns out better because I get the offsets, which allow me to fasten the cross members to the long runners individually. Also in this picture, you can see that the corners have been filled in with blocks. This is where the wheels will mount, once the skin is on. I didn’t want to have bolts protruding with nuts and washers on the ends, so I went with lag screws into these think chunks instead. The chunks are formed by cutting playwood pieces, and gluing them together down in the hole. That basically forms a nice 3.5″ chunks of wood that is glued through and through from skin to skin. Here is the base with the skin and wheels on it. It may not look like it, because the base is sitting atop an assembly table which itself is pretty long, but this thing is pretty big. It’s also fairly solid. When I put it on the floor, I stood on it, tried to kick it around and the like, and even without any other supports on it, it’s not moving, bending, flexing, or what have you. I believe the torsion box will do a nice job. One deviation I made from the typical cabinets that I’ve see is that they will typically have the wheels touching the ‘top’ skin, the the rest of the torsion box hanging down towards the floor. Well, I wanted to get the wheels solidly under the whole thing, with not potential for a shearing force breaking the plywood along the mounting plate of the wheel, so I went this direction. But, that begs the question. There is now roughly 5.5″ of space that just hanging below the bottom skin and the floor. What can be done with that? I thought, well, I can put some drawers down below of course. I could have just put some hanging drawer sliders down there, and called it a day, but I went with a slightly different design. I wanted to have something that could change easily over time, so I went with a French cleat system, which could take any attachments over time, starting with some drawers that I had laying around from some cabinet that wasn’t being used. So, two side by side sections of hanging French cleats, the one on the left with drawer installed. 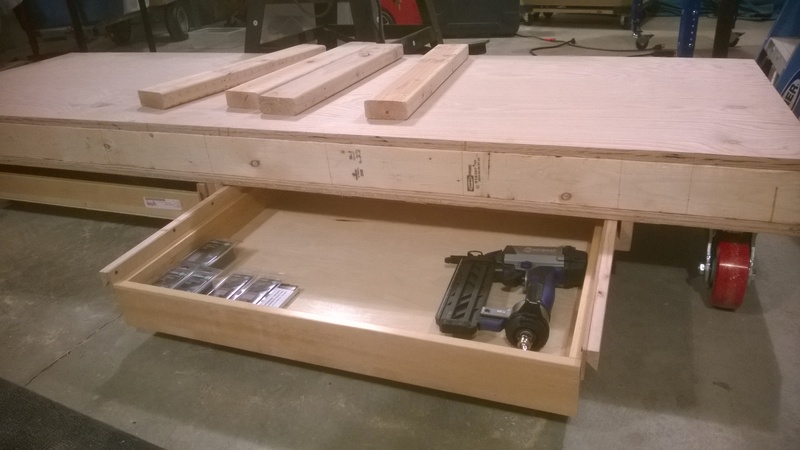 With the offset from the base, the drawers are about 4 inches tall, leaving around 1.5″ to the floor. That’s a great usage of space as far as I’m concerned. 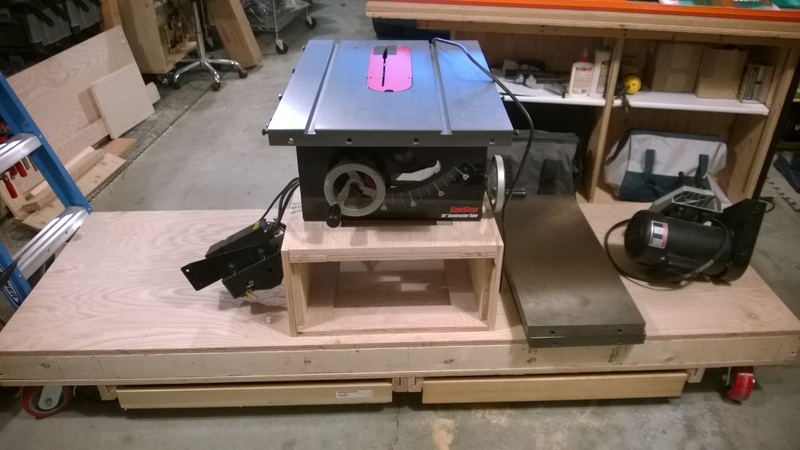 With this setup, I can keep some things that are commonly used with the table saw, or assembly, or just things that don’t quite have anywhere else to live at the moment. So, this is phase one. 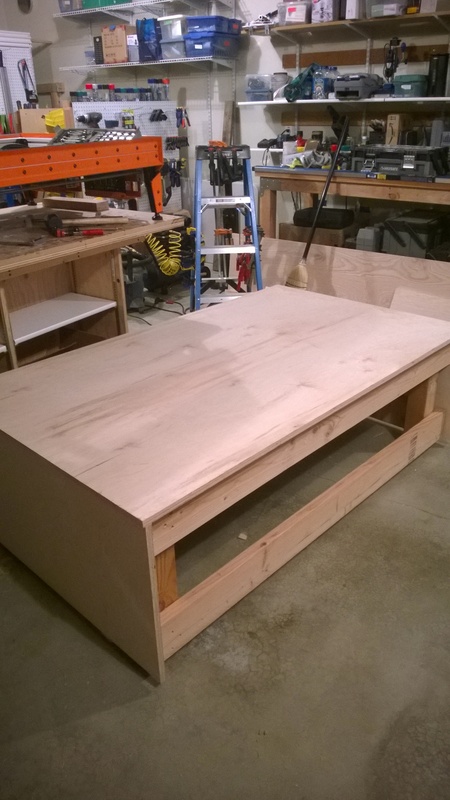 The non-sagging base, ready for the cabinetry work to be set atop, which will actually hold the saw and table surfaces.